Arriving at Palandoken, Turkey, the Rothlauf / Walter T40 moved down one to 56th place, 12 in class. (after 32 days) They are now 2 days and 15 hours behind the leader.... Impossible task, obviously. Arriving at Hamadan, Iran, the Rothlauf / Walter T40 moved to 57th place, still 13 in class. The last run through Iran was quite straightforward, with little changes in positions. The Surtees/Bayliss Jeep (No 97) remains in the lead at the end of day 30, making full advantage of the slightly easier schedule laid out for the pre-1950 cars. The Thomas/Zannis, 1950 Ford Coupe (No 23) still lies in second, and less than half a minute in penalties separates the next half dozen cars, so there is still much to play for. A fatal accident struck the Challenge: A VW cabrio driven by Josef and Rene Feit collided with a bus, killing both drivers. The Rothlauf / Walter T40 moved to 62nd place. The Bugatti T40 of Walter Rothlauf/Fritz Walter from Germany in a 1928 Bugatti Type 40 tourer of 1496 cc is struggling back up the list, after they dropped down on the 14th day, reportedly due to a bend rear axle. A mechanic with a new one was flown over. The results are listed below, with first the day, followed by position, and position in class. The T57 was extremely original, for the T35 I do not know. I attended the bugatti festival of 97 in Molsheim and Dambach-la-ville on the 13th of september. There were about 20 cars in the show and even the sun came to make it a wonderful day. The cars didn't all race the two passes on the roadbook because of beeing very late after the lunch, which was a bit dissapointing to take the pictures!!! I must say I was very pleased to see the cars but also to hear them..really terrific. September 1, 1997 Bugatti motoring adventure has finally started! Finally the Fund race (now called motoring adventure) has started! Bob Meijer and Macko Lacquer started July 31, from Molsheim, for their round-the-world trip. Several Bugattistes came to wish them good luck for their 33.000 km Journey, amongst them Caroline Bugatti, granddaughter of Ettore, in her T35A, accompanied by her friend François Rinaldi. So, after some delays, the prestigious project is going to start! The two Type 46 "Petit Royale" Bugattis are ready, as are their drivers. The cars, capable of 150km/h, equipped with a tourer body, can take 200 litres of petrol, 50 of oil, two spare tires, tools and parts. The start was from the front of the Schlumpf museum in Mulhouse, the first visit was to Molsheim. From France the trip goes to Holland, where the Bugs will be shipped from Rotterdam, through Buenos Aires to Ushuaia, the most southern city of the world on the Argentinian half of Fireland. From there the voyage will lead through Chile, Northern Argentina, Bolivia and Peru. From there the cars will be shipped to Tokyo and will ride to Hirosjima and Nagasaki (May 1998). Again shipment to Peking, followed by a ride through China to Tibet, Nepal and India, September next year. After a stop for the winter, spring 1999 the voyage will be continued to Pakistan, China again, Uzbekistan, Turkmenistan, Azerbeidjanand Georgia. Finally, fall of 1999, the two valiant T46's will go through the Ukrain, St. Petersburg, Helsinki, the Baltic states, Poland and Hungary, back to Mulhouse, France, where the "Bugatti Motoring Adventure" will end towards the turn of the century (or Millenium). It will be hard to imagine that Bob and Macko will then keep still, probably they will invent something new! 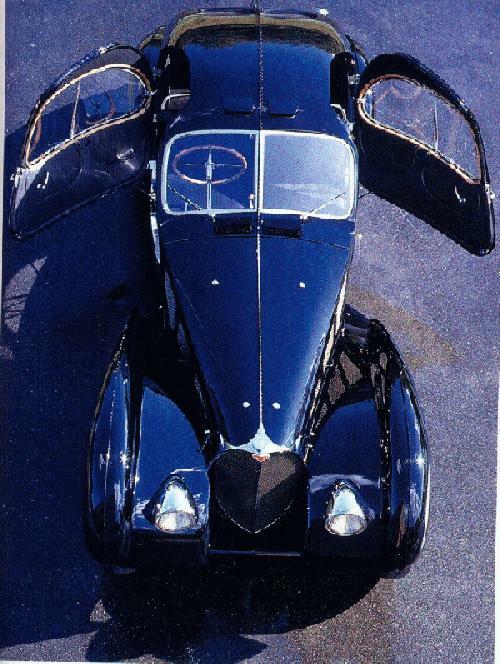 July 9, 1997 Bugatti Atlantic most beautiful car ever! With sweeping natural form and stylish detailing, the sensational Atlantique is Jean Bugatti's masterstroke. Debuted at the l935 Salon de Paris, this swoopy coupé boldly encapsulates 1930s design trends, the elegant age of Art Deco and a new trend for streamlining. The artistic traditions of the Bugatti family, Grandfather Carlo's idiosyncratic furniture, father Ettore's genius for engineering beauty and son Jean's natural eye for form and style are encapsulated in this remarkable design. Originally christened the Aerolithe, the dramatic body of the first car was made of elektron and because of difficulty welding, the sections were riveted together, aircraft style. The exposed seams with button-head rivets ran down the spine of the main body and the curvaceous wings. The doors with distinctive semi-ellipsoidal windows also displayed aviation influence and cut well into the roof to improve access. Only three production Atlantiques were built and, unlike the original Aerolithe, featured V-type Type 57S radiator designs. The practicality of the Atlantique was less satisfactory. Inside the cockpit, conversation was almost impossible over 40mph and the handling was compromised by the extra weight over the rear wheels. The fate of the original Aerolithe remains a mystery but the others survive, two in America and one in France. Delwyn Mallett Collector "For superimposing machine-age flanges and rivets on what is an outrageous design"
Jack Telnack Designer "Proportion, stance,form, construction details, finish; all perfect"
Patrick le Quement Stylist "The best example of Jean Bugattis flamboyant era, combining aesthetics and originality"
So the tremendous talent of Jean Bugatti is finally accepted worldwide, what would have happened if he hadn't had that fatal accident in 1939?? Number 2 and 3 of the election are the Jaguar E-type and the Alfa Romeo 2900. Of course there is one more Bugatti in the top 20: The T35 ended up at 13, between two Ferraris, the 275 GTB and the 250 SWB. The T35 is called the zenith of functional Beauty. LJK Setright Journalist: " It is relatively easy to make a racing car beautiful (though nobody does now) but I have seen road-equipped specimens that look gorgeous" The T35 by the way finished 16 in the top 100 of classics, published last year in C&SC. MODENA, Italy - Fewer than expected fans of legendary Italian racing car maker Bugatti turned out on Friday for a special auction of assets of the crashed company. Some 40 people turned up at a courtroom in the northern Italian town of Modena to witness the sale, but only seven of the 14 lots on offer found a buyer despite 26 sealed bids -- well below the receivers' expectations. Bugatti Automobili Campogalliano : the 5 of april was the auction that as sold most of the Italian Bugatti magnificent factory. 6 cars were sold to Bugatti international in Luxemburg, and all the rest, chassis, all spare parts...were sold to the Monaco Racing Team! In this lot included the EB 112 project with stamps, toolling to produce and the wole production line. The Monaco Racing Team sold to a German compagny called Dauer Racing a large part of the spare parts for them to create a service center. All the 112 project was brought back to Monaco and the 112 bordeaux was shown as a pace car at the grand prix of monaco in the last days. 6 EB 112 have been built : one was destroyed by crash test, one complete and running is the preproduction prototype(one at half by Giugiaro and half by me) and 4 chassis to be finished which were the only one to be production cars. In their auction in Tarrytown on April 26, 1997, a 1927 Bugatti T35B was sold for $486,500. April 4 was the auction of the Bugatti factory at Modena, the factory and some of the remaining cars were sold for 4.7 billion lira (5.3 million guilders, approx. $ 3 million), which was more than the estimate, which was 4.7 billion Lira. A frim from Luxemburg bought the remaining cars for 1.3 billion lira (approx. $ 0.8 million). The remaining parts were sold to a firm in Monaco. Most machines and tools also found new owners, but another auction will be needed to sell all. Not for auction was the Bugatti name, which is still owned by Romano Artioli's Luxemburg based firm Bugatti International. This firm also is under suspension of payment, so... maybe the name will also be auctioned when Bugatti International goes bankrupt.?? March 19, 1997 Various about Bugatti Automobili SPa. According to published information (Chicago Tribune's Auto News) Bugatti Automobili S.p.A.'s creditors are going to hold an auction on April 4th at the Modena factory to sell off the remaining assets of the late supercar maker. Among the items up for sale include some unfinished EB110's as well as a few unsold (or at least undelivered) EB110's, the physical plant/factory building, tools, spares, jigs, and so forth. One item not up for sale is the Bugatti trademark name. While a number of highly reliable sources say the factory has been cleaned out for some time, it appears that those items carted off (by creditors assumably) will be trucked back for this auction. One rumor that has some credibility is that FIAT will put in a bid for the Bugatti factory (but not for the rights to resurrect the EB110 line) and then *if successful* will make it a Maserati assembly facility. That certainly sounds credible as Maserati has been looking for room to grow with the success of the Quattroportte sedan and buying a $60 million US facility for perhaps under $15 million is good economics. Other news that shows that Bugatti's last attempts to stave off the enevitable has ended is that the EB112 sedan is said to be just weeks away from being bought and eventually resurrected by Lamborghini Automobili SpA. Thursday, January 11 died Robert Aumaître in Molsheim, at the age of 93. "Le Grand Robert" as he was known, was one of the last who had worked for Bugatti. He came to service in 1930 and was mechanic to Jean Bugatti. He experienced Jean's last moments, when he was killed in an accident, the night of August 11, 1939. A traumatic experience that affected Aumaître so deeply that he, shortly before his dead, he told that he still dreamed about this. After WWII he technically assisted French race driver Jean Monneret and was involved with various record attempts using Vespa's on Monthléry. Also he designed a Vespa-engine driven catamaran, that crossed the channel in 1947, and was early involved in a rally for bicycles with engines from Paris to Alpe d'Huez. After his retirement as manager with a big Cognac company he spent his last years in Molsheim, where he also has been burried. > >By that time i will have endless amounts of Digital Photo's available. In their auction at The Royal Horticultural (New) Halls, London SW1 on Tuesday, 3rd December 1996.